I just made some new rear upper mounts and I need new lower shock mounts. I'm seeing a couple different ones online. One looks like I'm guessing the original on CPP. This is Chevy of the 40s in the picture. Looks like mine but with a hole drilled in and a bolt stuck through it and the head tacked to the bracket. Looks like a tight fit for the U bolt nut what ya Think? Here's also a picture of mine. Both sides look like they were cut off like the uppers were. I'm thinking drill a hole, run the shock bolts in and just weld bthem together. No big nut where U bolt nut needs to go. Thoughts? Drill out mine and weld or buy new? I think you can grind that weld off and take a big punch and knock that piece out. I'd give that a go before ordering a piece that will look just like the one you might be able to fab up in a few minutes. It's two pieces? Beats drilling it out, I'll give it a shot tomorrow. My buddy came by for a few this morning. Said my little flux core welder might not work for this. Said TIG would be better to weld the stainless to mild steel. That is what I went to, the lower retainer with a shock mount. Got ones for a 55 Chevy passenger car. Looks nice. I had holes drilled in some half steel I had left over. Wonder what cheaper, new retainer or new mounts. Notice on the original parts that the stub is welded on the face of the bracket - not in a drilled hole thru. Requires big welding equipment, probably resistance welded. Hard to see in the photo as I had them powder coated black. That Chevy of the 40’s part is crap. BTW I don’t buy from them after they sent me a damaged part a few years ago and wouldn’t do anything about it. Bad guys for that. The spring plates with shock ears are for a GM 3 inch axle housing on ’53 Chevy springs. My springs are actually Posies super slider springs. I bought the plates for $59 from the Truck Shop. Good guys never any problems. And by the way just remember when making those shock brackets one very important thing people overlook. They look at it like "just a shock" bracket like it's not holding the car up or anything so it doesn't need to be that strong. Well it has MILLIONS of pulls and pushes on it during a trip. Pulling down, pushing up, pulling down, pushing up. MILLIONS of times and that can cause a LOT of fatigue cracking something that is pretty strong. I recently had to weld up cracks and missing pieces around the holes on a 74 Blazer. It was a simple hole in the side of the frame made of 1/4 steel. Just a hole in the middle of 1/4" steel and those MILLIONS UPON MILLIONS of pushing and pulling cracked around holes breaking it into chunks! I removed the shocks then taped on the frame around there with a hammer with these "corn flake" chunks falling off the frame around the hole! We are talking up to about 3/8" long chunks! That pushing and pulling can cause a lot of stress, respect that! Yea, I was a bit paranoid about the mounts. The upper ones I made are probably over done. A lot thicker than the stock one. I can't find those lower plates by themselves. I see them in kits, I see them without shock ears, and the ones I do see either are not for 1.75 inch springs or don't specify. I think the plate would look nicer than the stock one under the plates I have but I guess no one would ever see. 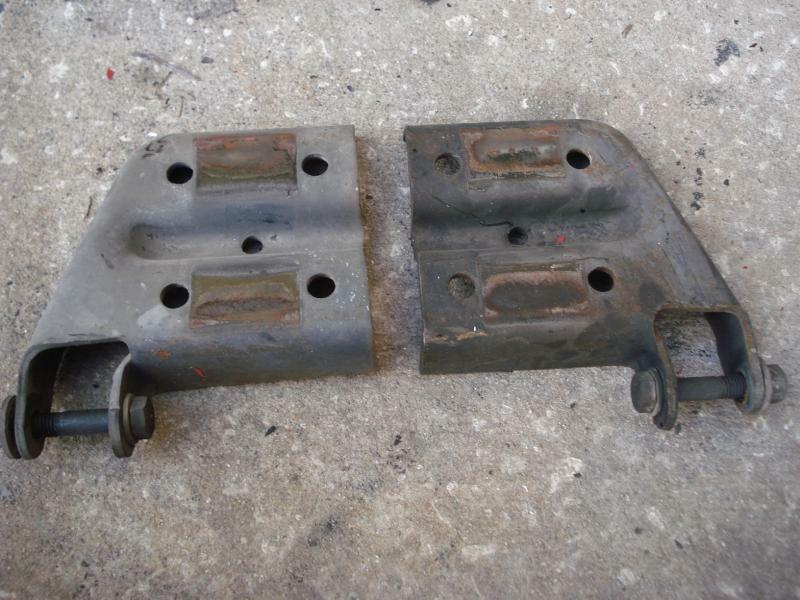 get some leaf plates from an s10 blazer, you will need to open the holes slightly for the u bolts but it has a stronger shock mount than the s10 truck which is just the single shear pin. the blazer mount is double sided. Any particular year Joedoh? Something like that would look better, I would just need some advice on how to figure out what shocks to get. These would just need a little modifying to accept the 1/75 inch spring? That sort of thing doesnt cause any shifting issues? I think its a 95 up thing, it might be 98 up. I have had a few sets but never an occasion to use em, the pin mount has never given me any problems.